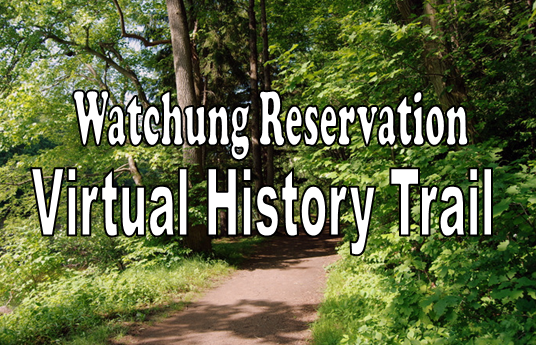 The Watchung Reservation History Trail is a 6-mile trail that visits and identifies sites of historic interest in Union County’s Watchung Reservation, a 2,000+acre preserve located in the northern portion of the County. The Reservation is an integral part of the Union County Parks system, designed by the Olmsted Brothers of Brookline, Mass., the celebrated landscape architects who designed New York’s Central Park and scores of other notable public lands. The stops along the History Trail recall features from the early years of the Watchung Reservation, or describe uses of the land before it was incorporated into the park. The trail is marked with pink blazes, with signs on posts along the trail identifying the location of each site. The trail is designed to start and end at the Trailside Nature & Science Center, but can also be accessed from parking areas at the Deserted Village of Feltville and Lake Surprise. This virtual version of the trail (www.ucnj.org/wrht) is designed so that people with disabilities can also experience the trail. It also includes features enabling hikers to identify trees and animal life encountered along the way.